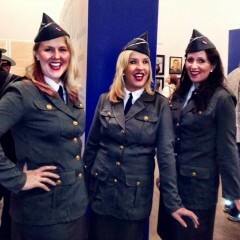 Andrews Sisters songs and stylings are the specialty of The NightinGals. The great songs of the Swing era are what set this group apart with tight three part harmony and terrific voices. Red sequin jackets sparkle for 4th of July, Military type outfits are suitable for any Armed Forces type celebration, and 40’s style white and red costumes are perfect for any special event. You choose which costume you prefer and The NightinGals will entertain you with Don’t Sit Under The Apple Tree, Sentimental Journey, Boogie Woogie Bugle Boy and more! These vocalists can sing a capella to greet your guests, stroll through your party, or perform to orchestra tracks for a Fabulous 40’s Show. When you could hear the ladies they were very good. It would have been better to have the microphones, very hard to hear the ladies. I thought their voices were great. Just didn't capture the voices as they strolled along the tables. Hi Linda--I'm sorry you weren't able to provide microphones too, as I do think it would have been easier to hear us. But I think each table was pleased with our performance as we went around the room. It was a pleasure to sing for your group! Everyone was so wonderful! Thanks Nathan! It was definitely a pleasure to sing for your group! this group has it all! Historical society of Long Beach hired them for opening of exhibit, "Long Beach remembers Pearl Harbor." They were wonderful and exactly fit what we needed-an Andrew Sisters like group. They have it all: talent, flexibility, personality, and "the look"....we will be hiring them again! Thank you for the glowing review! We had a wonderful time singing at your event! Looking forward to being back soon! If you need any Christmas Carolers, we also have the Christmas Belles, trios of women who sing beautifully and look stunning in gorgeous velvet costumes! This is the most professional and collaborative group of musicians ever. I gave them a very challenging project and they rose to the occasion. Their voices are angelic and they have the best attitude and spirit. I can't wait to hire them for my next event. Thanks Sandra! This has been great fun! The NightinGals provided the entertainment for our parents 90th birthday party. They were awesome. The performance was beyond our expectations (and we expected a lot!). We all, young and old, enjoyed their performance. The music was outstanding and the way they interacted with the audience made it made it really special. And to top it off, the enjoyment of our parents as they listened and reminisced the songs of the 40s was priceless. Thank you Barbara! I spoke to the singers and they said that the gig was a blast so I'm glad you were happy with the way it turned out. We look forward to singing for you again sometime! Loved having the Christmas Belles here for our brunch! They have beautiful voices, are cheerful and looked beautiful! Our many guests remarked about how nice it was to have them here! Couldn't be more pleased! Thank you Christmas Belles! 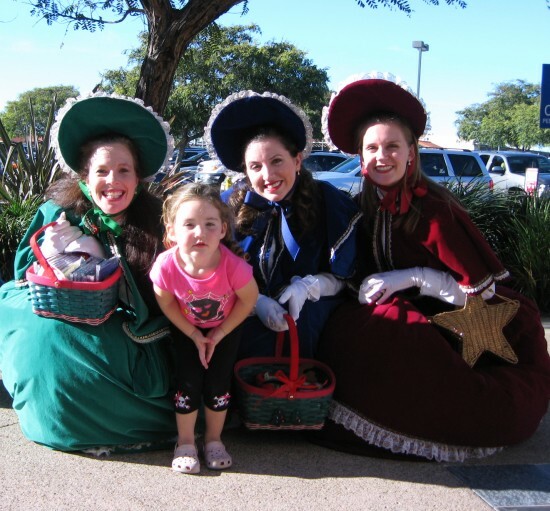 We hired the Christmas Belles for our Christmas party, and they were definitely the highlight of the party! Their repertoire of songs was wonderful, and they even sang a few of the carols in different languages, which was a completely unexpected but delightful surprise. I was incredibly thrilled to hear 'O Tannenbaum' in German! We were absolutely thrilled to have them join us and provide entertainment, and they are at the top of my list for any holiday party entertainment. Maribeth, I can't thank you enough for your wonderful, kind words! I'm so glad you enjoyed the Belles and I look forward to booking next year with you! The Christmas Belles were amazing. They arrived at the exact scheduled time. They were very professional, friendly, beautiful and had the most beautiful voices. There 3 part harmonies were amazing and they knew all the song that were requested. Everyone loved them. I would definitely have them back for our next party. Thank you Christmas Belles for making our party unforgettable!!! Thank you Devra! It was our pleasure to sing for you! Have a very Merry Christmas! Our Christmas party was a hit amount our friends and family. The christmas belles have wonderful voices, and there dresses were fantastic..they interacted with the children with there songs. We would definitely have them again and would reccomend them to all. What an experience Wow. Thank you so much for the wonderful review! I'm so glad you enjoyed having the Belles at your party! They had a wonderful time, too! Heavenly Voices Productions has been in the entertainment business since 1992, providing outstanding vocal music to satisfied clients all over Southern California. Our company features top notch professional singers with credits ranging from Broadway to Civic Light Operas, Cruise Lines, Disney,Touring companies and more. Our outstanding vocal groups blend tradition with class, laughter and joy in family friendly entertainment. All groups have the ability to perform a cappella; greeting guests, strolling through an event, or as focused "stage" entertainment. They also have an option to perform with orchestral tracks, or double trios for performances in larger venues. Heavenly Voices Productions has been in the entertainment business since 1992, providing outstanding vocal music to satisfied clients all over Southern California. Our company features top notch professional singers with credits ranging from Broadway to Civic Light Operas, Cruise Lines, Touring companies and more. Our outstanding vocal groups blend tradition with class, laughter and joy in family friendly entertainment. 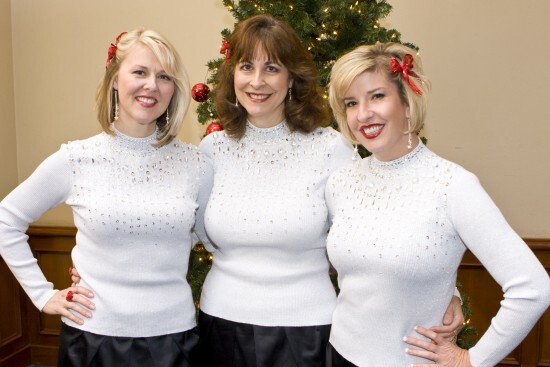 The Christmas Belles Carolers are a vocal trio whose voices soar in traditional carols like Silent Night, or jazz it up with a cool version of Santa Baby. 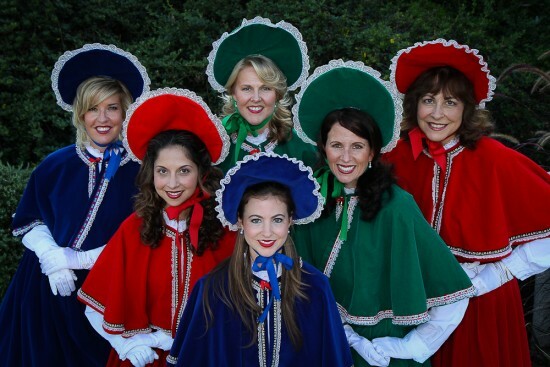 Gorgeous Dickens style costumes, fabulous musical arrangements and a large catalog of Holiday music all blend together to make our Carolers the best quality vocal group around. 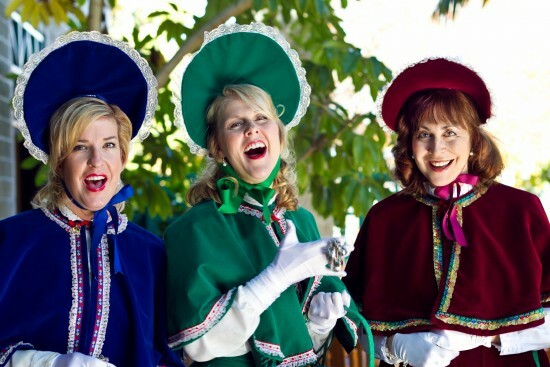 The Swing Time Carolers are a variation on The Christmas Belles, entertaining in more contemporary costumes, and focusing on more upbeat and popular holiday type music. Three part harmony will swing on Let It Snow, smoothly serenade you with The Christmas Song (Chestnuts roasting), or rollick with an upbeat Sleigh Ride. 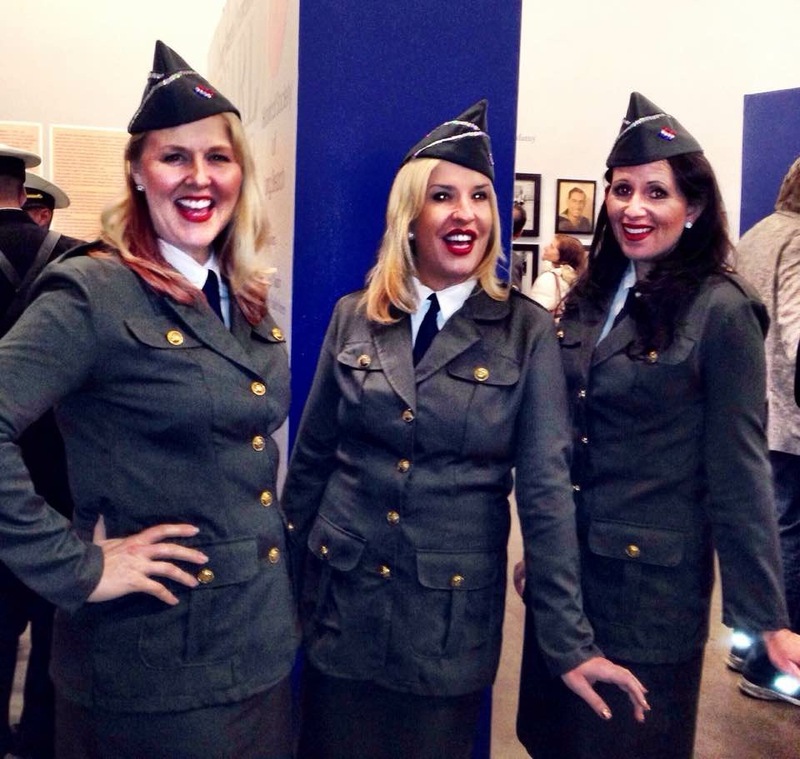 The NightinGals are an Andrews Sisters vocal trio specializing in music of the Swing Era. Awesome harmonies, great energy and terrific vocal arrangements make this group perfect for any year-round entertainment. All groups also have an option to perform with orchestral tracks, or double trios for performances in larger venues. A sound system with three microphones is required. The Manhattan Transfer, The Andrews Sisters, The Nylons, and all other great a capella groups!